Single Thread Farms Restaurant & Inn was conceived long before I first met Kyle Connaughton in March of 2014 at the Rediscovering Coastal Cuisine event in Carmel, California. I know this because I had heard murmurings of it before I heard about it from Connaughton himself. Now, nearly two years later, the multi-faceted enterprise – which, as suggested by its name, includes a farm, a restaurant, and a five-room inn – is about to open in Healdsburg in Sonoma County. Having worked for Michel Bras (in Japan), Heston Blumenthal (at The Fat Duck), and having contributed to Nathan Myhrvold’s multi-tomed “Modernist Cuisine,” it’s understandable why Connaughton has attracted so much attention for this upcoming project. 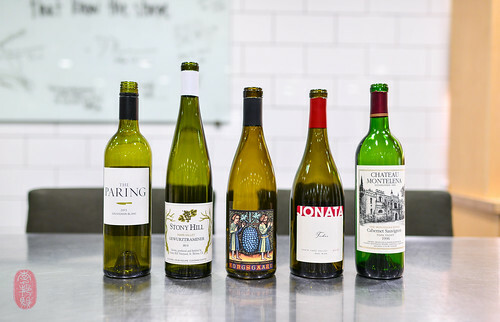 So, his timely appearance on the ninth night of this year’s Twelve Days of Christmas at the invitation of hosting chef Christopher Kostow offered a glimpse into what we might expect from him at Single Thread. Connaughton arrived with a suite of cookware, utensils, and plates, many of which were custom-made for him. Used in table-side presentations, they were put to great effect; among the most impressive at this year’s Twelve Days of Christmas. At this dinner, he showed off the versatility and virtues of the donabe. He used it to smoke Mount Lassen trout with cherry wood chips. Connaughton and his wife Katina (who will be running the farm side of the Single Thread operation) set up a station in the center of the kitchen for this showy canapé during the pre-dinner reception. Guests were invited into center court to see the sight and to smell the smoke. The warm fish, barely cooked, was served with koji made from Buddha’s hand and some salty shio koji vinaigrette. Connaughton baked cod with root vegetables in a larger donabe. Once cooked, the alabaster filets were tented with a pané topping, which was laminated to the fish under the broiler. 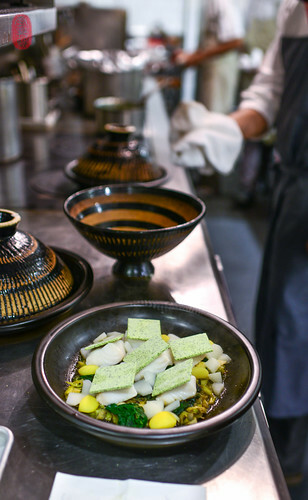 Presented family-style in the donabe, the fish and its accompaniments, including a delicious walnut-nori “pesto,” were portioned individually at the table. And, the donabe was used to steam chestnut cake. Like many Asian cakes, this one was almost jarringly unsweetened. 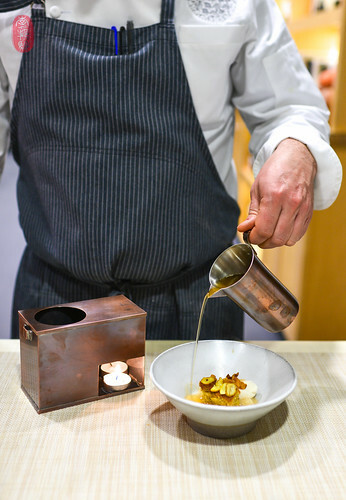 Connaughton balanced out the dessert with a marshmallow sherbet of fromage blanc and a syrupy, warm pear broth, which was poured out of a beautiful, copper vessel that arrived in its own heated carrier (photo below). 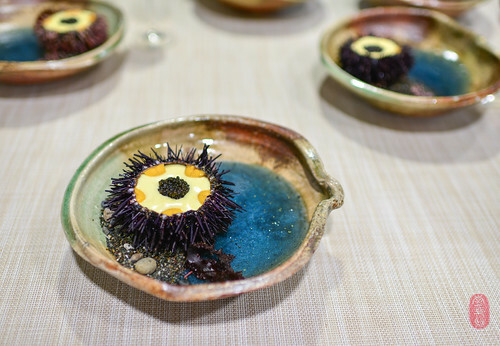 One of the most visually arresting dishes of the night was Connaughton’s sea urchin course. 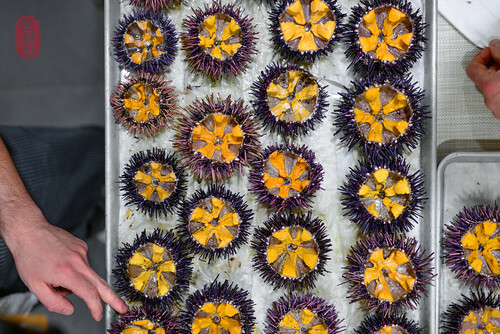 Aaron Koseba, Connaughton’s chef de cuisine at Single Thread, had gone diving off the Sonoma Coast for these urchins the day before. Koseba hauled in a giant cooler brimming with sea water and over a hundred of these spiny creatures. The spines were pared back and the tops carefully cut open to reveal the star-shaped gonads inside. Leaving the gonads intact, the urchins were cleaned out. For service, negi (scallion) panna cotta was spooned into the shell, which was then piped full of warm, frothy potato purée. All of this was crowned, generously, with caviar. As you can imagine, altogether, this was incredibly rich. The urchins were presented on a diorama of rock, sand, and “seawater” (dyed water set with lots of gelatin). 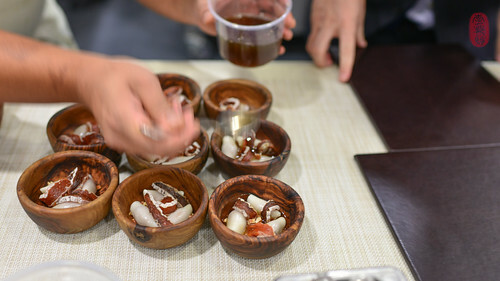 Kostow echoed Connaughton’s Japanese-style dessert with a dessert of mochi (pounded glutinous rice) and persimmons (both ripe and dried). All of it glistened with a warm syrup sweetened with piloncillo. Kostow also served wedges of Contralto cheese (from Andante Dairy in Petaluma, California) brushed with acorn miso and lightly sautéed rabe. It’s a combination I never would have thought would work together. But it did, incredibly well. Below, you’ll find the menu from the ninth night of the Twelve Days of Christmas featuring Kyle Connaughton. To see all of the photos from this dinner, CLICK HERE. Buddha’s hand koji and shio koji vinaigrette. Alpine cheese, onion, and yeast. Onion panna cotta, roasted potato, caviar. Speck, pine nut, white truffle. Root vegetable, walnut nori pesto. Fromage blanc marshmallow, pear broth. Below are links to my posts and photos from all of the Twelve Days of Christmas dinners I have attended over the past four years at the Restaurant at Meadowood. Each chef is listed with the restaurant with which they were cooking at the time they participated in the event (some have moved on to other projects and restaurants). * Connaughton gifted me a copy of this cookbook when he arrived at the Twelve Days of Christmas. 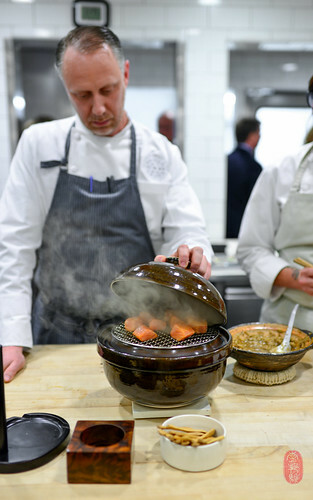 Photos: Cleaning sea urchins; Kyle Connaughton smoking Mount Lassen trout in a donabe; baked black cod in a donabe waiting to be flashed under the broiler; Connaughton’s sea urchin course, with negi panna cotta, warm potato purée, and caviar; Kostow’s dessert of pounded glutinous rice, with pecans, persimmons and piloncillo; the wine pairings; and Kyle Connaughton pouring warm pear syrup into a bowl of steamed chestnut cake and fromage blanc sherbet. ~ by ulterior epicure on December 26, 2015.